America’s farmers need a safety net, but so do the rich soil and clean water that sustain not just agriculture but the entire fabric of American society. Almost three decades ago, congress recognized the need to protect these valuable resources when it wrote so-called “conservation compliance” provisions into the 1985 farm bill. these provisions established a simple quid pro quo recognizing the shared responsibility of taxpayers, farmers and landowners to ensure that our land remains productive and our streams run clear. in return for generous taxpayer support, growers agreed to apply simple practices to prevent soil erosion on vulnerable cropland. And congress reaffi rmed a decades-long tradition of sharing the cost of these protective measures among those who work the land, those who own it and the taxpayers who are sustained by its bounty. As this paper by agricultural conservation expert Max Schnepf makes clear, a solid majority of farmers have consistently agreed over the years that this longstanding compact is a fair deal. Today, with the Sept. 30 deadline for reauthorizing the farm bill drawing ever nearer, the urgency of reinvigorating and strengthening this conservation quid pro quo has moved to the center of the farm policy debate, for two reasons. First, agriculture lobbyists are trying to persuade congress to enact a new generation of farm subsidies that would guarantee farm business income – with no conservation requirements at all. Second, record high grain prices and misguided biofuel mandates are creating powerful incentives for farmers to squeeze every last bushel of crop from every last acre. in the drive for all-out production, conservation is once again being pushed to the back seat – the very situation that led to enactment of conservation compliance provisions in the fi rst place. 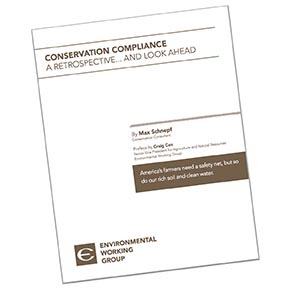 The Environmental Working Group (EWG) asked Schnepf, a conservationist with deep experience in agriculture, to chronicle the history of America’s conservation quid pro quo. We wanted to know what these provisions had accomplished, what key decisions during implementation drove those accomplishments and, most of all, how farmers regard this long-standing bargain between themselves and taxpayers. the conservation quid pro quo worked. According to USDA’s economic research service, soil erosion on highly erodible cropland was cut by 40 percent after conservation compliance was implemented. A solid majority of farmers polled in 1982, 1983, 1987, 1991, 1994, 2001 and 2010 have consistently supported the idea that farmers ought to control erosion in return for taxpayer support. But Mr. Schnepf’s paper also makes clear that this all-important safety net is badly frayed today. We at EWG think that with congress poised to reauthorize the farm bill, now is the time to renew and update this all-important compact among farmers, landowners and taxpayers.